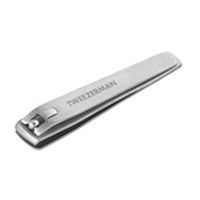 This heavy-duty clipper has sharp, straight edges for cutting toenails and acrylic nail tips with maximum precision. To avoid cracking and splitting, soften toenails by soaking before trimming. Clip nails straight across with stainless steel blades to prevent ingrowns, making sure not to cut below the nail bed.